I need rest. Sleep restores and prepare my mind, body, and spirit so I can be the active, creative, positive mom-wife-friend-writer-consultant I want to be. This means making the most of precious nighttime hours, when nothing demands attention, when my surroundings are quiet. Though the night is quiet, my mind is not. A noisy train of thoughts whirs and clacks around the winding tracks of my brain. Sometimes this locomotive whistles and chugs the moment I hit the pillow, sabotaging sleep before it even begins. Other times it comes as a midnight train that interrupts my slumber. The train of thought keeps me up at night. So I’ve been searching for techniques to quiet the mental noise. 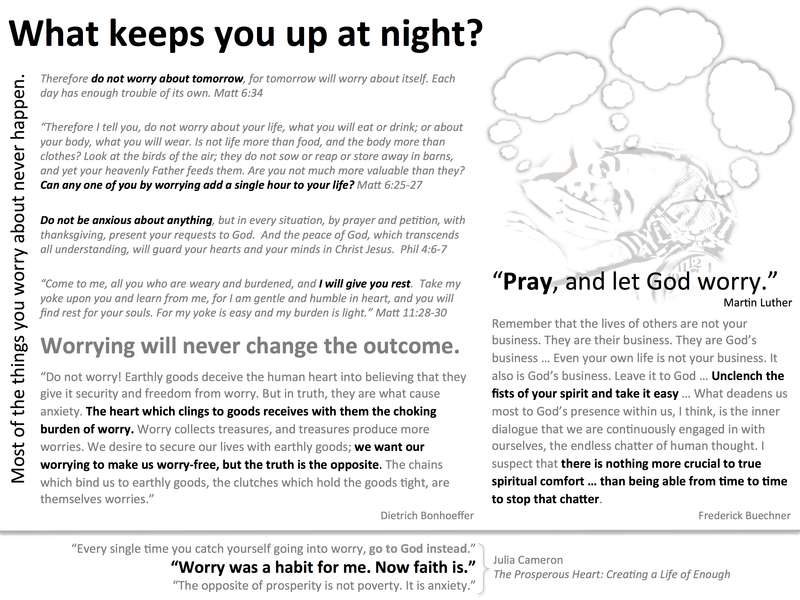 Rather than wrestle with the question, “What keeps me up at night?” (that list of worries takes care of itself), I’m exploring ways to get more and better rest. Keep pen or pencil and paper on your nightstand. When to-do’s or anxieties overtake you, make a list or free-write. One friend does this in the dark, so as not to wake her husband. It doesn’t matter if her writing is legible. She may never read what’s on the page. She just has to get the worries out, to clear her mind and get back to sleep. Let a song or hymn fill your mind. The more calming and repetitive the better. One friend likes Taize hymns. My last few actions before bed usually involve checking the calendar, laying out clothes, organizing/packing for work and school, setting an alarm, maybe even checking email. All these activities propel my brain into tomorrow, which feeds my inclination to fret about missing a train, forgetting a meeting, handling a tough situation. One practical friend suggested doing these future-focused things earlier in the day—before or after dinner, perhaps. She even goes so far as to plan the week’s outfits on Sunday. Good idea. Embrace the idea of segmented sleep. Your six to eight hours need not come all at once. Give yourself permission to be awake awhile—maybe to read or listen to music or just lie still. That alone could eliminate the stressful feeling that you’re not getting enough rest … so you can rest. Pray yourself back to sleep. For best results, express gratitude rather than a list of concerns. Saying “Thank you for keeping me calm”—even if you’re churning with worry—can shift your mind to a more trusting, restful place. One friend has a small bowl at his bedside, decorated with a cross. Touching the four points of the cross helps him connect with a calming sense of faith. A former Catholic still picks up her rosary, returning to tactile, rhythmic prayers she learned as a child. Inspired but unfamiliar with rosaries and prayer beads, I researched and made several sets of prayer beads for friends who have joined me in this quest for rest. I gave them all away without reserving a strand for me. Maybe this weekend I can string another set. This could be a scripture, a poem, or affirmation. Regardless, repeated words become a mantra. A yoga instructor explained to me that a mantra is a “mind protector”—a phrase that occupies the mind, leaving no space for destructive or anxious thoughts to invade. I love that imagery. It makes the whole idea of mantras more palatable to me. I’ve been playing with phrases like “I have enough, I am enough” and “breathe, release.” I silently recite the first half of the mantra on an inhale, and the second half on an exhale. Of all the techniques I’ve learned so far, this is helping me the most—not just at night, but any time I need to find focus or calm. Sounds like you are exploring lots of different options and finding what works for you. That is a great way to do it. One thing i wanted to echo that you said is not to put so much emphasis on sleep, just on rest. (Without TV or books , etc) That along with some kind of focus (breath, prayer, mantra, breath, whatever you find that you like) will slow the mind and whether you sleep right away or not, you will benefit from the rest and sleep will follow naturally. I like what you said about shifting your evening rituals too. Another thing might be to address daytime stresses in general. Have you been taking on other people’s stuff? Need to let more stuff go? Practicing meditation in the daytime when stress comes up will help you clear your mind and stay on your side of the street. Also it will help give you the space to remember in the moment to turn your stuff over to the One watching over you. I do that all the time. “Duh, Val, God’s got this.” (Picture me face-palming myself) I really love how you are approaching this. Like am experiment. Wishing you well on your journey!